Switching EHRs to an interoperable LTC-specific platform makes sense for your practice. Stop struggling with an EHR platform that wasn’t designed to support the needs of long-term care practitioners. GEHRIMED was developed by leaders in long-term care who recognize that other EHR systems contain unnecessary features and require complicated workarounds to achieve the same results. GEHRIMED is the first interoperable ONC-certified LTC EHR that mirrors the way LTPAC practitioners provide care. Robust reporting tools and an easy-to-use interface streamline your workflow, protect against compliance audits, and increase your profitability. With a dedicated support team by your side, switching EHRs to GEHRIMED is a seamless transition toward a smarter solution. Cloud-based mobile electronic health records enable administrators and practitioners to access shared patient information anytime, anywhere. Our implementation team will transfer patient records from your existing EHR to GEHRIMED in under 30 days. Your team will have immediate access to comprehensive patient records with no manual data entry. GEHRIMED prevents unauthorized users from accessing patient records and logs all user activity, ensuring that protected health information (PHI) is never exposed. GEHRIMED’s electronically secured notes and data enable your team to quickly and easily retrieve all necessary documentation if your practice is ever faced with an audit. GEHRIMED’s ONC-certified integrated solution provides realtime interoperability with facility EHRs to help support the communication between practitioners, facilities and pharmacies. CPT code protection reduces the risk of selecting the wrong billing code and sending an inaccurate bill, minimizing the risk of inaccuracies that can ultimately delaying the billing cycle. GEHRIMED’s secure, cloud-based platform includes multiple layers of protection to help LTPAC practitioners work more efficiently in a secure environment. End-to-end HIPAA-compliant security features ensure that your practice complies with patient health information privacy rules, including internal messaging tools that allow you to easily collaborate with colleagues without the risk of PHI confidentiality breaches. Should you experience weak or intermittent internet connectivity, GEHRIMED’s connection extension functionality enables your encounter to remain active without a connection for up to 15 minutes, so you can provide uninterrupted care and avoid the risk of temporarily storing PHI on an unsecure device. With data backups every 10 minutes, dual authentication and encryption features, and detailed user activity logs, patient data is protected at all times. 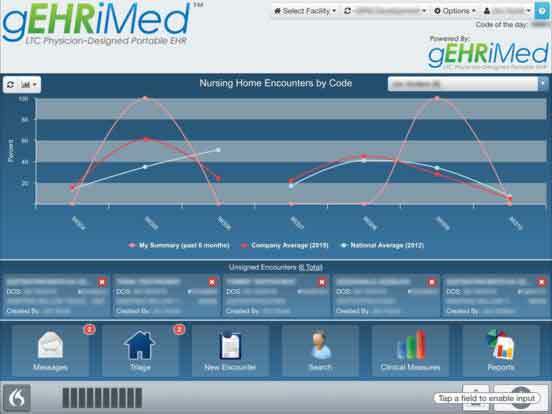 “GEHRIMED is the 4th EMR that I’ve used. Beginning with residency, I was around for the deployment of all 4 products. GEHRIMED has been, indisputably, the most intuitive and user friendly. Perhaps more importantly, the support staff at GEHRIMED have been the most responsive, helpful and collegial." -Dr. Jerry Bruggeman, MD, MBA - Advanced Senior Care, Inc.